One of several ironies within the hand-wringing over rural America’s alleged neglect by coastal elites is that the people lamenting our underappreciation of “flyover country” rarely talk about it like it deserves anything different. The reason so many of our country’s best under-the-radar, surprising, and otherwise slept-on travel destinations are in the Midwest, or at least the middle-ish regions of the country, is because vast swaths of the US are painted as the most boring, homogenous, and deeply uneventful places on Earth. Urban Americans are lectured to familiarize themselves with small-town culture out of a sense of civic duty or some such, but from a travel perspective people rarely just pick up and go. In 1987, Jamestown, Tennessee, resident Mike Walker set in motion an event that will finally put, like, six states on the map. That was when he launched the 127 Yard Sale (named for an eponymous highway) to lure drivers off the interstates and into the wondrous small towns they’d never have otherwise known were there. The annual event soon spread into Kentucky, and so on and so on until, 32 years on now it also runs through Michigan and Ohio and Georgia and Alabama. 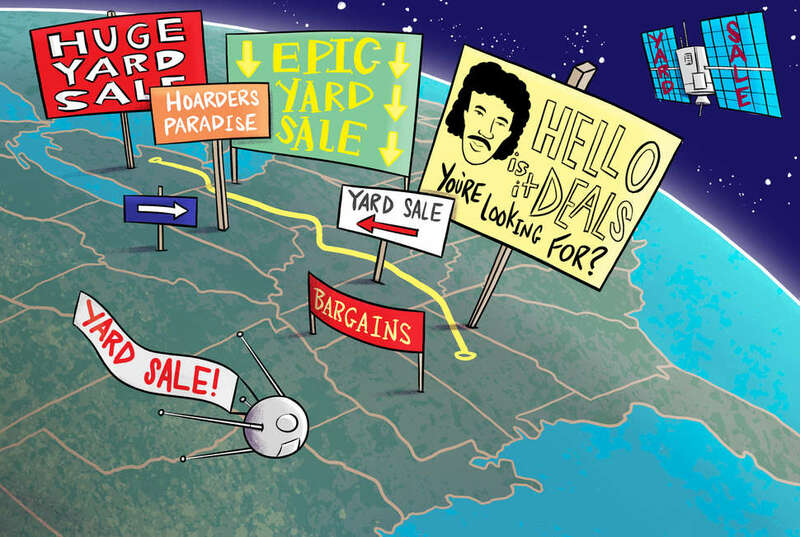 Today, 127 Yard Sale is the World’s Longest (or alternately Largest) Yard Sale, spanning 690 miles and pulling hundreds of thousands of spectators and bargain-hunters into its orbit each year. It’s enormous. It’s weird. It’s the Great Wall of Made in China. It’s Cracker Barrel: the Extended Remix. It’s O.B.O. Americana on full display. Here’s what we know about it. First things first -- when is the 127 Yard Sale? The whole shebang is held each year from the first Thursday in August through the first Sunday -- so, this year from August 2-5. Lots of vendors will have some means of accepting credit cards, but all things considered you’re better off going with cash. Some people like to strategically ship things home as they go, lest their trunks and pockets fill up by Friday. The 127 Yard Sale begins in Addison, Michigan, and ends down in Gadsden, Alabama. Or vice versa; there are no rules here. Highway 127 comprises the bulk of the route. It runs out in Chattanooga, Tennessee, where the mantle is taken up by Lookout Mountain Parkway. Do people do the whole thing? 690 miles? The idea isn’t to see the entire thing from top to bottom -- you don’t get a T-shirt or anything if you finish the whole route. As a ballpark for those of you who want to cover some ground, aim for maybe 100 miles per day. Much more than that and you’re really spending the weekend in your car, and the point here is to actually stop places and see things. Scenic drives are great. Enjoy them any other weekend of the year when there isn’t so very much to stop for. So, because of the sheer size of the yard sale it’s almost impossible to track all the changes from one year to the next and determine what will be where. You can, however, search the route online for hubs of 25 vendors or more. Tennessee and Kentucky typically boast the highest concentrations of vendors. Which isn’t to say those vendors are necessarily any more or less interesting, or charming or treasure-laden or whatever particular aesthetic you’re projecting onto all this; just that there are more. 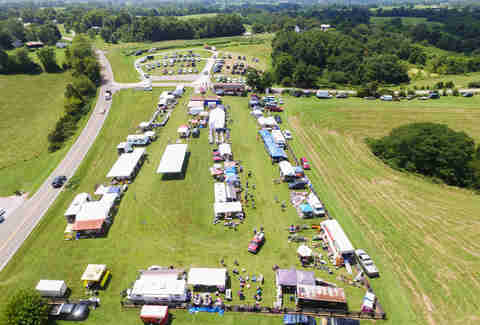 The section radiating out from Crossville, Tennessee -- with Signal Mountain to the south and the birthplace site Jamestown to the north -- will reliably have a whole boatload of vendors. If you find yourself as far down as Georgia and Alabama, try to hit the particularly lovely stretch that follows the Lookout Mountain Parkway. Lol no. This is entirely subject to the whims of each individual vendor, but generally speaking -- very generally speaking -- you’re looking at mid-morning through dusk. And what am I looking for? 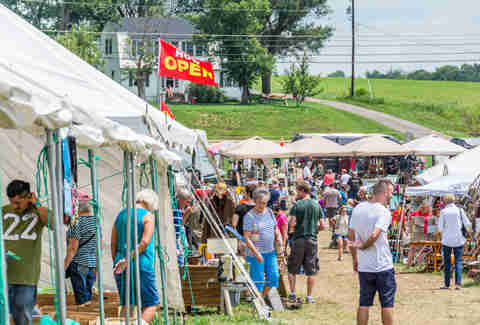 As much as such things can be ascertained -- it’s not like there’s a 127 Yard Sale census -- the route attracts a mix of locals hitting up vendors in their area and visitors who travel from out of state(s) for the purpose of experiencing the thing as, like, a curiosity. Randall speaks of “one lady from California who drives out every year, turns it into a two-week vacation, drives back.” She typically hits Tennessee and Kentucky, which is also what Randall recommends you do if you’re open to suggestion here. Does the yard sale get Weird? Uh huh. In that charming, deep-fried-giant-gummy-bears-at-the-state-fair kind of way that all the best yard sales and even the most mediocre Midwest and Midwest-ish novelty attractions hope to achieve.